Teak Oil (Penetrating Oil) Penetrating oils, often called teak oil (outdoor finish) or danish oil (indoor finish), soak into the wood and don't build up on the surface. They may contain linseed, rosewood, or tung oil, and an assortment of other ingredients. Teak oil isn't made from the teak tree, it is so named because it is often used on teak wood. Most penetrating oils are very easy to apply. Wipe the oil on with a brush or rag, wait a few minutes for it to soak into the wood, then wipe off the excess. Penetrating oils will never chip, crack or peel, since the finish is in the wood. If the wood is fully exposed to the sun and rain year-round and you want to keep the wood looking like new, most penetrating oils need to be reapplied 1 to 2 times a year. If the wood is protected from the elements by shade, such as a porch, you may only need to reapply the oil once every few years. Generally speaking, as the amount of pigment is increased in a penetrating oil, the length of time increases before you need to reapply it. 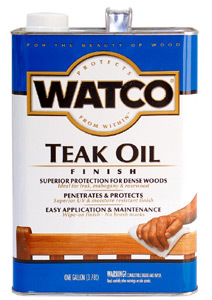 An excellent penetrating oil is Watco Teak Oil. It contains boiled linseed oil, Ultraviolet (UV) light inhibitors for sun protection, and a mildew inhibitor. Linseed oil is a natural finish made from flax seeds, a common ingredient of paint and finishes for centuries. It works well on any type of wood, including dense woods like Teak, Mahogany, or Rosewood. If you get a scratch in the finish, it can be easily touched up by simply re-oiling the area.